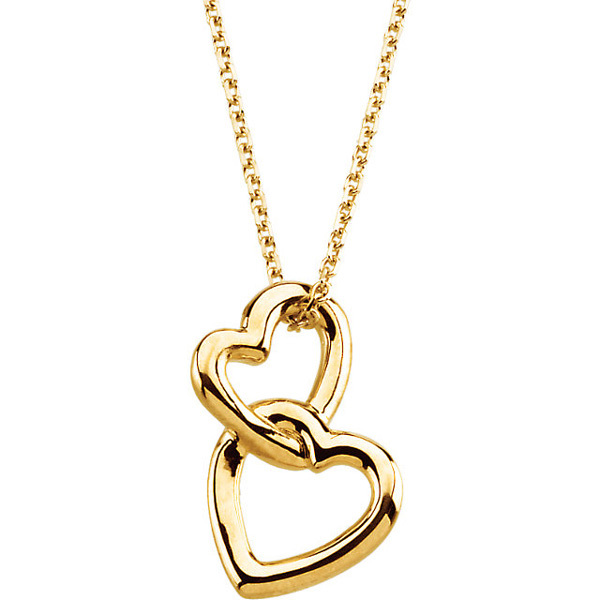 Two hearts of gold intertwine in this simple but meaningful pendant, creating a style that's beautiful and that holds a message that's hard to miss. This interlocking design is a picture of two lives that are linked together in love and that cannot be pulled apart. While the shapes are simple, the meaning behind them is powerful and is presented in an elegant fashion that makes these hearts both classic and timely. A highly-polished finish gives this look a sense of timeless class. Like the love you share, this pendant will retain its shine and its appeal for years to come. Pendant measures 20mm x 12mm and weighs approx. 2.43 grams. Pendant comes with a 1.5mm rope chain. 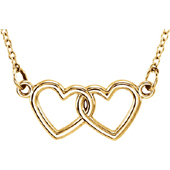 We guarantee our Double Heart Pendant, 14K Yellow Gold to be high quality, authentic jewelry, as described above.